From 0 months: Gym – the baby lies on its back on the padded base, by touching the 2 rattles attached to the panel, the lights and melodies are activated. From 4 months: Baby Seat – offers a comfortable support for the infant, who by moving its little feet can reach the 2 rattles attached to the panel, activating melodies and lights. 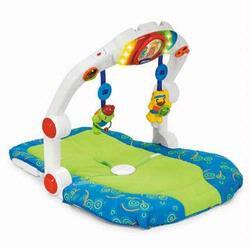 From 6 months: Activity Mat – the baby lies prone, moving its arms in order to touch the activities present on the panel. Strengthening neck and back muscles in this way.